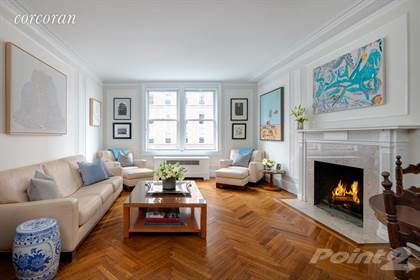 "Located in a premier prewar J.E.R. Carpenter co-operative, this sun-flooded corner classic six is in mint condition and has oblique views of Central Park. It has through-the-wall air conditioning, herringbone floors and oversized windows. The beautiful home has a gracious layout for both entertaining and comfortable living. The entrance foyer opens onto the dining area/gallery which leads to the elegant living room that faces south with two large windows and a wood burning fireplace. Also off the dining area/gallery is a library that has been outfitted with built-in bookcases. The windowed eat-in kitchen has been meticulously renovated and has custom cabinets to the ceiling and Ashfield Schist granite countertops. It is equipped with top-of-the-line appliances including a Subzero refrigerator/freezer, a Viking oven and range, a Viking microwave/convection oven and a Miele dishwasher. Off the kitchen is a butlers pantry with a built-in desk and a laundry closet with a Miele washer/dryer. As for the private quarters, there is a corner master bedroom that faces south and east and is drenched in sun throughout the day. It has two closets and built in bookshelves. The second bedroom also faces south. There is a windowed hallway bathroom finished with Carrara marble floors. The third bedroom faces east and has an en-suite windowed bathroom with a shower completed with Carrara marble floors. A coat closet and three hallway closets complete the home. A storage bin transfers with the sale and the building allows 70% financing. There is a 2% flip tax paid by the purchaser. Built in 1924, this white-glove co-operative is perfectly located on Fifth Avenue in Carnegie Hill. There is a full-time doorman, a live-in resident manager, a central laundry room and a bicycle room. There is also a state-of-the-art fitness center that has a Peloton bike, pilates machines and TRX equipment with additional plans to further upgrade it. Directly across Fifth Avenue will be a brand-new playground in Central Park. The building enjoys close proximity to the citys greatest museums along with an impressive concentration of galleries, elegant boutiques, five-star restaurants and schools." Hi, I'd like to find out more information about 1150 Fifth Avenue. Thanks so much!